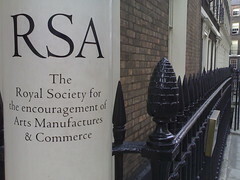 I’m one of the half dozen BBC people attending The Social Impact of the Web event today at the RSA (Royal Society for the encouragement of Arts, Manufactures & Commerce) in London. The first panel to get a crack at answering this question includes Georgina Henry, Editor, Comment is Free & Editor, The Guardian; Andrew Chadwick from Royal Holloway, University of London; and Tom Steinberg, Founder and Director, mySociety and other projects. Audio and video streams of the event are available here. The production/consumption divide: Pew study said only 8% were deep users of social media (median age 28), only 7% were connectors. 26% were “indifferent” and/or “disconnected” – and the median age was 64. The vast majority is not producing and the older are more likely to be excluded. The shift to video: Back in the old days, we spoke about how text only communication broke down barriers (eg. text frees you to be who you are, not who you look like). Is worried that the sound bite politics of today will be put on youtube and will limit deep political discourse. The people who make mysociety happen are the coders and people in the background. “tool-smiths” – people who build tools that make it possible for people to find out who their local politicians are and how to contact them – a Netherlands based voting recommendation service had nearly 5 million users, in a country with about 3 times that in population (a massive percentage)… it’s a tool, not a piece of journalism. Or moveon in America that helped mobilise masses of people…. largely driven by web 1.0 email. I’ve just noticed that Sandy Walkington, a Lib Dem councillor from St. Albans where I live, is sitting in the row in front of me. He runs a few web based campaigns, including one called Hands off Herts which raises awareness of development issues in the county of Hertfordshire. People won’t seek out brands and organisations that they have never heard of or that their friends don’t use. strong viral effect basically mimics the mass media affect… and is arguably more valuable because it’s more personal. Sell codeine. Metabolism of codeine in urine. Cheap codeine. Tylenol with codeine. Codeine. Side effects of codeine. Buy codeine. Online pharmacy codeine 222. Tylenol with codeine elixir concentration. Codeine. Allergic symptoms signs codeine. 50 mg codeine phosphate equivalent. Liquid codeine. Hard to annunciate fioricet codeine. Codeine extraction. Codeine. Codeine false positives. Alprazolam no prescription. Alprazolam without prescription. Alprazolam. Soma compound. Soma. Watson soma. Best online pricing for soma.